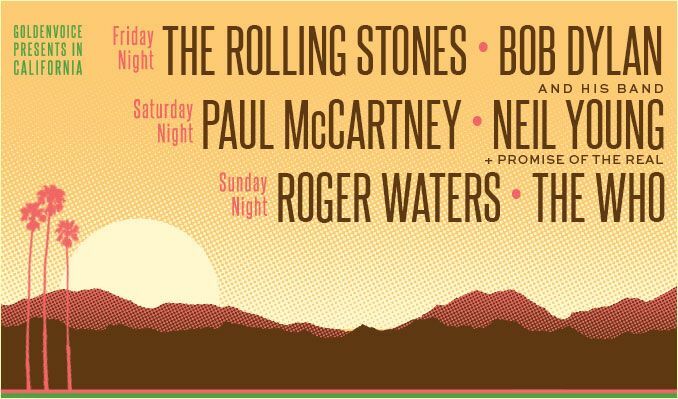 By now it's been announced for a few days but if you haven't seen it, there is a new festival called the Desert Trip Festival. You can read all about it from the NY Times, but the crux is the biggest names in rock and roll history (who are still playing) are coming together for a three day festival in Indio, California outside of Palm Springs and also the site of Coachella. Beatles and Stones and Dylan Oh My! This will be an epic show on many fronts, boomers will find it hard to pass up. There will be huge dollars for scalpers but there will probably never be a lineup like this ever again.Something about it doesn't sit right with us though and we can't put our finger on it? Maybe it is because we just got back from Jazzfest and are festival'ed out, but we are not chomping at the bit to grab tickets and we can't figure out why? Granted are all time favorites are playing, but we are not super excited by it and are a bit confused by that. Feel free to post your thoughts below some recent live video from the big name fest players.